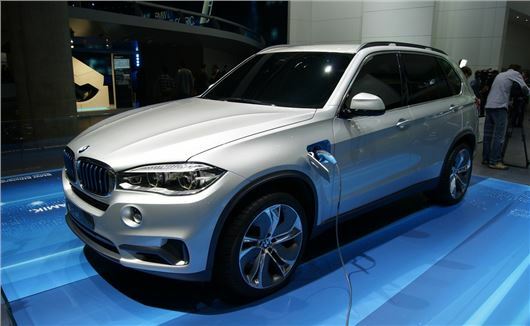 BMW has unveiled a plug-in hybrid version of the X5 at the Frankfurt Motor Show. The X5 eDrive concept will be capable of travelling 19 miles in electric-only mode, as well as returning 74mpg and 90g/km of CO2. Following hot on the heels of the Range Rover hybrid, which was also launched at Frankfurt, the BMW will be powered by a four-cylinder engine, coupled to a 70kW/95HP electric motor. The eDrive concept will feature the same all-wheel drive system as the standard X5 and feature a similar load capacity, with the lithium-ion battery positioned underneath the car to save space. BMW has developed the electric motor and battery in-house, with the latter being compatible with any domestic power socket. There is a choice of three driving modes: intelligent hybrid drive for a balance between sportiness and efficiency; pure electric for emission-free driving; or Safe Battery mode to maintain the current battery charge. On its own – albeit for 19 miles – the electric motor will be capable of propelling the X5 to a top speed of 75mph, while the addition of the combustion engine will improve performance further. Indeed, BMW claims the X5 eDrive concept will be a potent performer, capable of covering 0-62mph in under seven seconds. The X5 will also get a number of styling changes, which will include specially designed roof rails, a connector for the charging cable that lights up during charging, and 21-inch light-alloy wheels. Although no indication has been given regarding production, it's thought the X5 eDrive could be available in the UK from 2016 onwards.